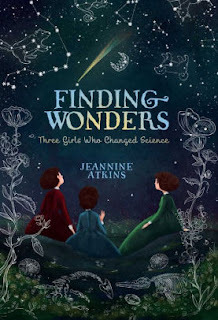 Through verse, Finding Wonders explores the childhoods of Maria Merian, Mary Anning, and Maria Mitchell (early pioneers in biology, paleontology, astronomy respectively), showing how their interest in the world around them developed. While a century or more separates each of them, there are similarities in the support they received from their families and in their own persistence and endurance. And, of course, there are plenty of similar obstacles from males around them who find the idea that a women (let alone a girl) would have any aptitude in the hard sciences. The stories focus on their early struggles, but each time Atkins traces their life stories through to adulthood to show the eventual success and recognition that each of these women achieved. It's compelling material, but I was disappointed with the final product. Atkins notes that she had rather thin documentary material to call on for the lives of Merian and Anning. The verse style was her strategy for glossing over those deficits (as it allows her to skip about and leave unfinished business). It also leaves a superficial feel to the story. We never get a strong feel for these girls and what really drove them on. That is, except for Mitchell's story. Now, Mitchell's story is more compelling to me for at least two reasons (her upbringing as a Quaker and her later career as an instructor at my alma mater, Vassar College), but it is plain to see the difference that richer sources bring to the story. And while the verse is still trite, the story itself is significantly more moving. Excellent notes and a bibliography at the end will be invaluable to stimulating readers to search out more about the lives and impact of these women. That will make the book appealing to librarians and educators.